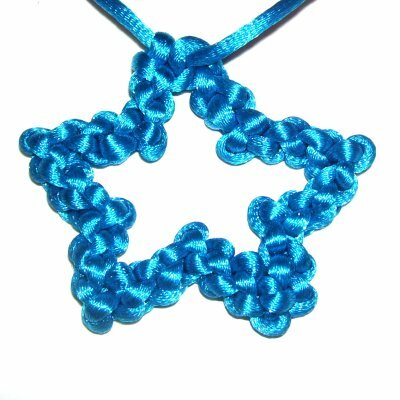 Description: The Star Pendant features the decorative knot called the Zipper Sennit. 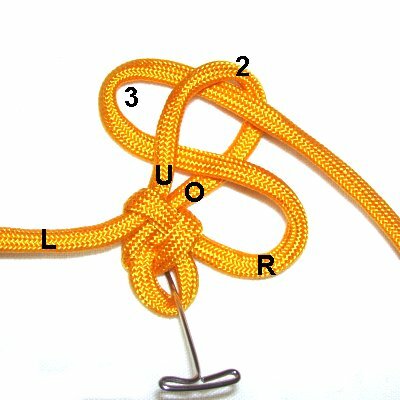 You will tie short chains of zippers, followed by a transition called an elbow. This causes the design to change directions, which forms the angles for the star. Holiday Ornament: Use 4mm material, as in the example shown below. Earring Design: Use 1mm size material. Pendant: Use 2mm material, as shown in the image above. I found this design on the Fusion Knots website, under the name DeAna Star Sinnet. Click on the image or link to visit this site. 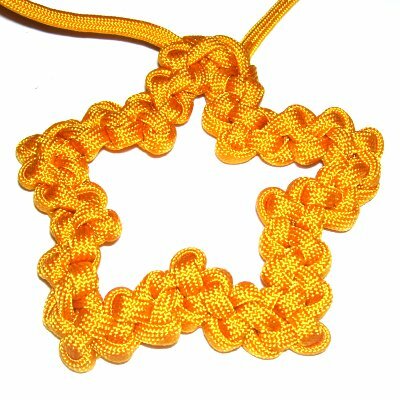 Preparation: Cut one cord at least 3 yards long, if using 1mm -2mm material to make the Star Pendant. For 4mm material, you need at least 4 yards. 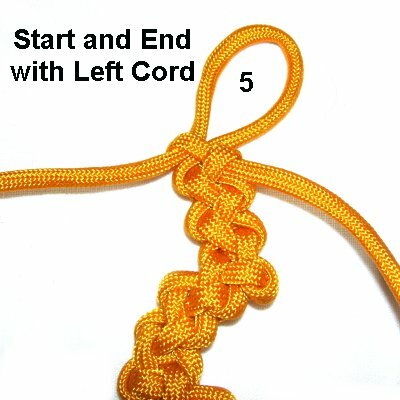 Prepare the ends of the cord using a method most suitable for the material you are working with. 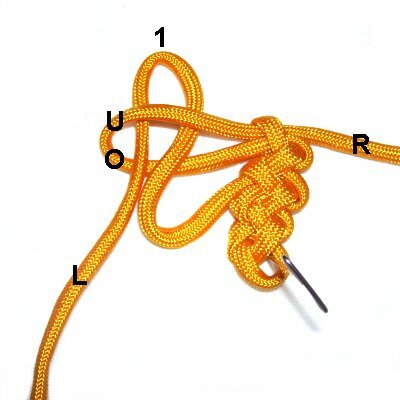 For Paracord or Satin, melt the tips with a flame. 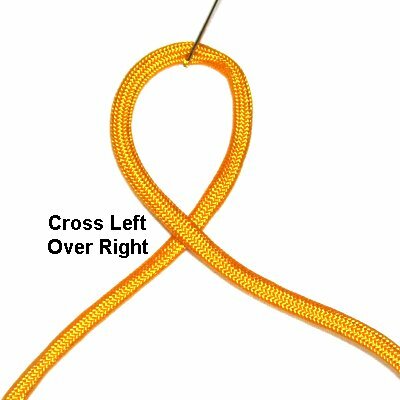 << Make a loop in the center of the cord, crossing left over right. Step 1, continued: Pull on the bight to tighten the loop slightly, but leave some space for now. Mentally label the two ends where they are resting now (right and left). Step 2: Fold the left end to form bight 2. Pass it through bight 1 from the top, which is over - under. 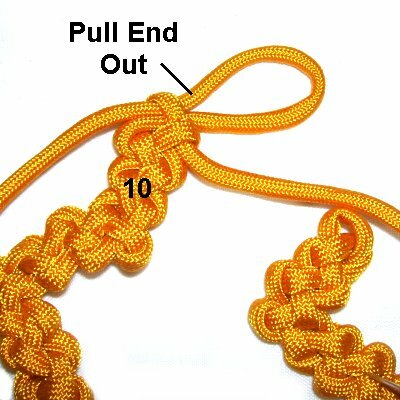 Pull on the right end to tighten bight 1. Leave a small loop at the bottom as shown, and secure it. Pull on bight 2 to tighten it, and then the left end to make it smaller. 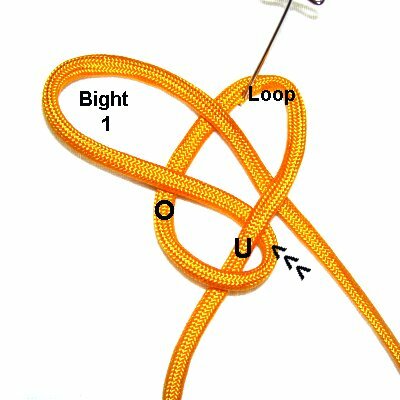 Fold the right end to make bight 3. Pass it through bight 2 over - under (from the top). Pull on the left end to tighten bight 2. Tighten bight 3 by pulling on it, and then reduce the size by pulling on the right end. 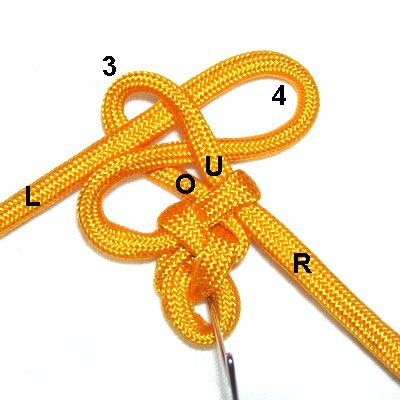 << Fold the left end to make the 4th bight. 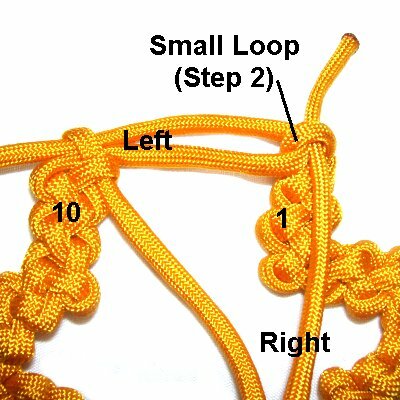 Pass it through bight 3, and tighten it as you did in the previous steps. This completes the first Zipper Sennit for the Star Pendant. Each time you repeat the process, you will form a total of 5 bights, similar to what you just did. You can change this number if you wish, but make sure you tie an odd number of bights, such as 7, 9, 11, etc. You must also be consistent all the way through the design. The next step is called a transition. It's formed with a bight, but is different from the regular zippers. A transition is not counted as part of the zipper sennits. Step 3: Use the right end again, and fold it to form another bight. Pass it through bight 5 under - over (from below). Important: The only time you pass the bight through under - over is at the transitions. When you make the Zipper sennits, it's always over - under. Step 3, continued: Make sure the right end is at the top, and nothing is twisted. 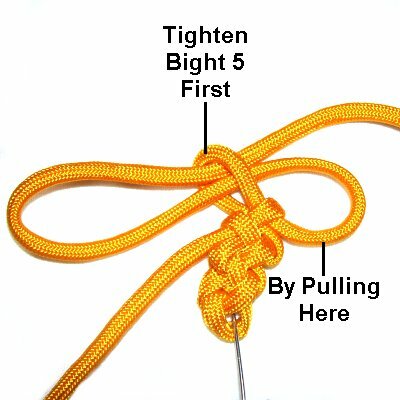 << Tighten bight 5 first, by pulling on the segment at the lower right. Step 4: To start the second Zipper sennit for the Star Pendant, fold the left end to make bight 1. Pass it through the transition over - under, heading vertically. 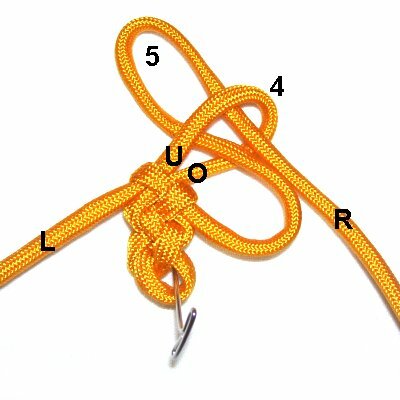 Tighten by pulling on the right end, followed by bight 1, and then the left end. Important: Start counting the bights after the transition is completed, so you don't include it in the count. 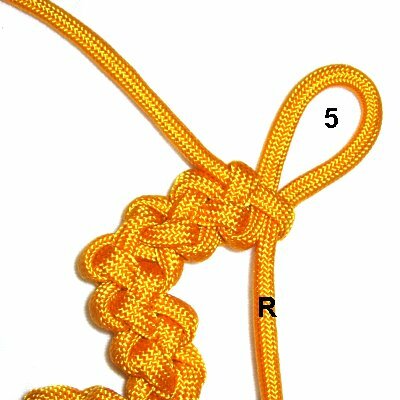 Remember that you make a total of 5 bights in each section of the Star Pendant, unless you have previously decided to change the number. 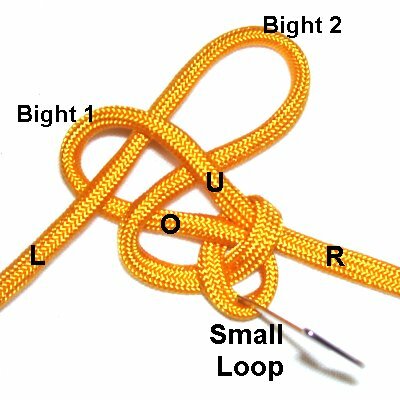 Bight 2 is made by folding the right end. Pass it through bight 1 over - under. Try to arrange it horizontally, so the corner is sharp. 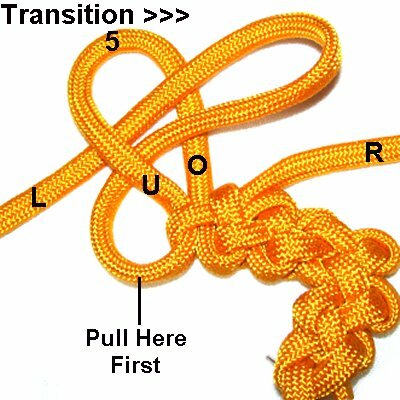 Tighten by pulling on the left end, followed by bight 2, and then the right end. Step 4, continued: The next step is to make bight 3 with the left end. Bight 4 is made with the right end. 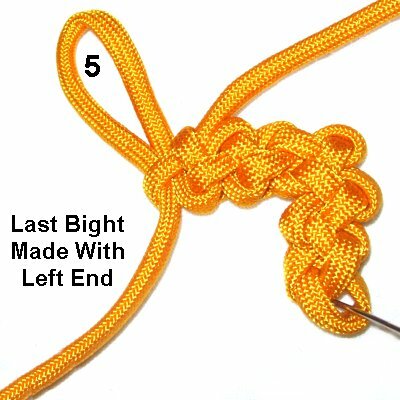 The 5th bight will be made with the left end. The transition is then made left to right, following the instructions below. Step 5: Form the bight for the next transition in the Star pendant using the left end. Pull on the area indicated at the lower left, to tighten bight 5. 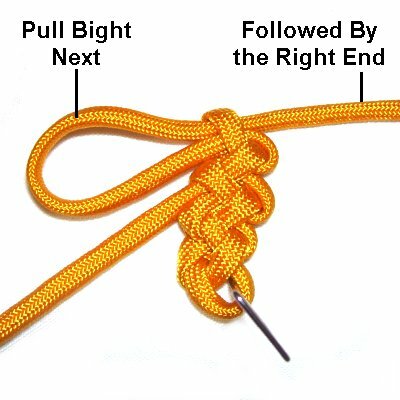 Pull on the new bight firmly, and then the left end. 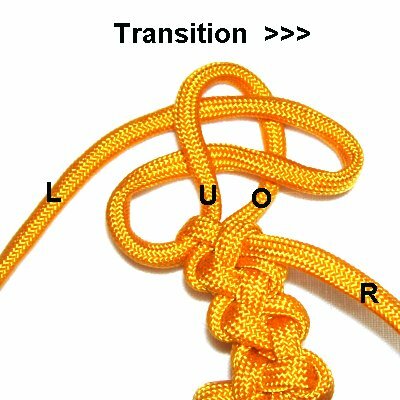 After you tighten the transition, make sure the bight is horizontal. 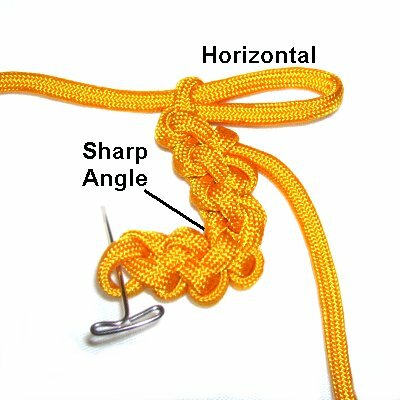 The previous Zipper sennits for the Star Pendant should be manipulated to form a sharp angle. Step 6: Repeat the same process to make the rest of the Star Pendant design, alternating directions each time. 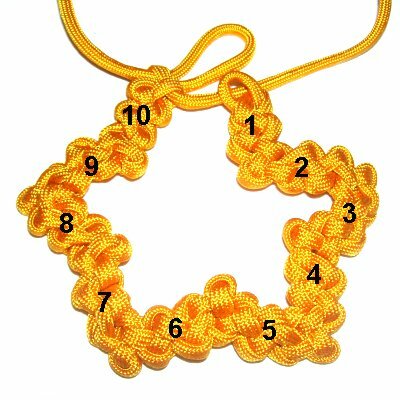 You need a total of 10 zipper sennits to create the star. The 3rd Zipper sennit starts and ends with the right end. The transition will be made moving right to left, with the right end. 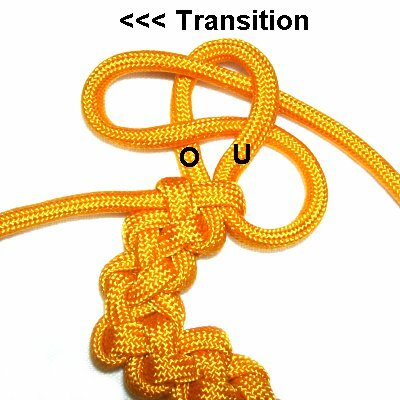 Make sure you pass the bight through under - over, the same as all the other transitions. The 4th section of Zipper Sennit starts and ends with the left end. The next transition is made left to right, using the left end. Step 7: Continue on, alternating directions, until you have 10 sections of Zippers. Be sure to count the sennits, not the angles. The 10th section should begin and end with a bight made by the left end. Step 8: Locate bight 4 in the 10th sennit. Pull the end out of the loop, moving left to right. Don't remove the entire bight, just the part leading to the tip of the cord. 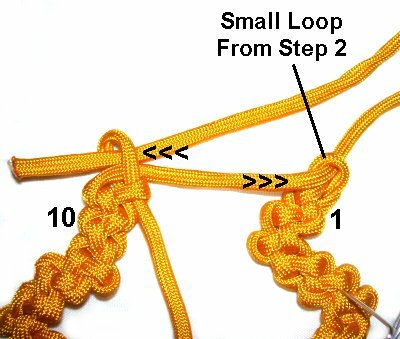 Step 9: Pass the left end through the small loop you made in section 1 (step 2). Enter it from the front. 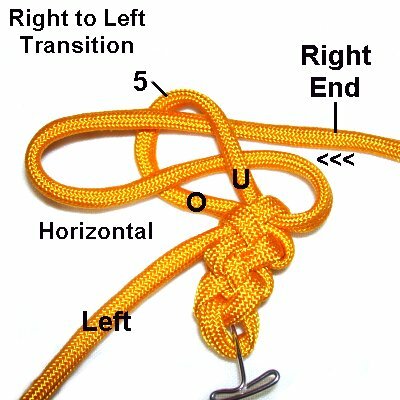 Bring the end back to the left, and pass it through bight 4 (section 10), where you pulled the end out in the last step. Pass the right end through the small loop in section 1 (step 2), from the front. Pull both ends to tighten the top of the Star Pendant. Step 10: Arrange the various segments and angles as needed to form the star shape. 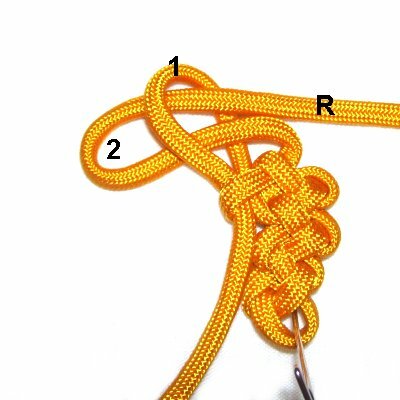 The best way to finish off the ends is to slide them through the back of the knots in the upper area. Another option is to attach other cords to them, for the necklace. A button knot in that area looks good, too. Have any comments about the Star Pendant? Contact Me.